Agility is a fast, exciting, fun activity for you and your dog. Agility involves competitors directing their dogs around obstacle courses in an attempt to both negotiate the obstacles correctly whilst they “beat the clock”. The obstacles comprise of different types of jumps, ramps, elevated walks, poles, tunnels and see-saws. Participation in agility training and trialling is great fun and enables you to provide a release for the energy of your pet in a way that can be much more interesting and exciting than a simple walk. It helps your dog become more responsible and gives you more control with a more obedient dog. Agility is an exciting way to enhance your leisure time with your dog. In many towns and cities throughout the country there are clubs which provide training either on weekends, weekday evenings or both. Competitions are held under the Rules and Regulations of each state’s governing body and are structured in a similar manner to equestrian events. A judge designs and sets up the obstacle course, measures its length and considering the degree of difficulty, calculates a standard time in which the course could be completed by the dog. Each dog competing has to complete the course within the set time and negotiate all the obstacles in the correct order to avoid receiving course penalties. 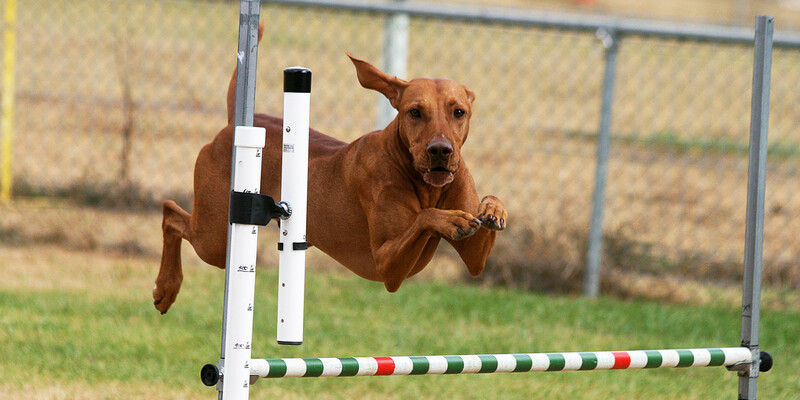 During agility and jumping trials there are several levels of competition ranging from novice to suit the newcomer through to master level for more experienced dogs. There are also jumping competitions which include only jumps and tunnels which gives the opportunity for dog owners have a go at trialling soon after they begin teaching their dogs the sport. Agility is one of the fastest growing dog sports in the world and can be enjoyed by any family owning a dog. Doing agility and jumping requires training. Dogs need to be able to negotiate the course without any help from the handler. Often the dog is working some distance from the handler and moving around the course with cues. There are lots of opportunities for mistakes but when handler and dog are truly working together it is exhilarating. The best place to find an agility dog club near you is to visit your state governing body website.